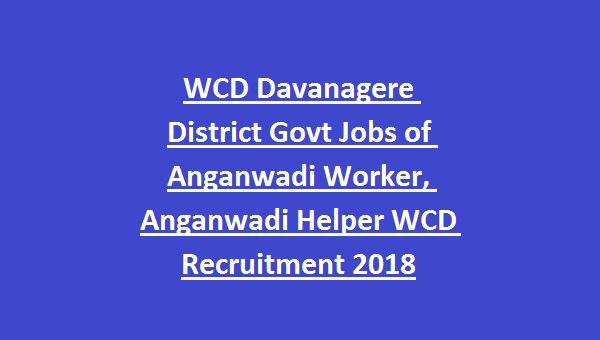 WCD Davanagere District Anganwadi Recruitment Vacancies 2019: Application forms through online invited by the Govt of Karnataka, WCD (Women & Child Development Department), Davanagere District for the recruitment of Anganwadi Worker and Anganwadi Helper Vacancies. Davanagere District WCD has released total 55 posts. Candidate should have age between 18 years to 35 years. Applicant must have passed 10th Class for Anganwadi Workers and for Anganwadi Helpers is minimum 4th standard pass and higher 9th standard pass. Candidates (Women) who are interested for these Anganwadi jobs may submit application forms from 07-12-2018 to 06-01-2019 using the District Recruitment link @ http://anganwadirecruit.kar.nic.in. Please go through the notification for Application procedure, age details, Educational qualification, Selection Process etc. 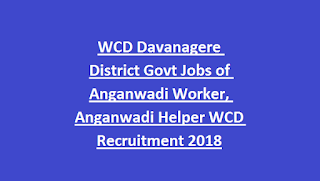 of Davanagere District Women and Child Development Department WCD Anganwadi Worker/ Anganwadi Helper Recruitment 74 Govt Vacancies. Karnataka Women & Child Development Department WCD Davanagere District has released total 69 Anganwadi Vacancies. 1. Anganwadi Workers: 12 posts. 2. Anganwadi Helpers: 43 posts. Anganwadi Helper: Must have passed minimum 4th standard pass and Higher qualification is 9th class pass. Anganwadi Worker: Must have passed SSLC/ 10th class. Check the Chikkaballapur District WCD Notification for Pay Scale details. Karnataka Women & Child Development Department, Davanagere District will select candidates for Anganwadi Worker/ Helper jobs based on their work experience and academic Qualifications/ Reservation. Interested/ Eligible women candidates are advised to apply for these Anganwadi vacancies from 07-12-2018 to 06-01-2019 through online using the official website http://anganwadirecruit.kar.nic.in.